Dale Gillham is, “one of Australia’s most respected analysts” (Wealth Creator Magazine, Nov/Dec 2004). A sought-after key note speaker and author of the bestselling book How to Beat the Managed Funds by 20%, he has assisted thousands of traders and investors around Australia and throughout the world to become confident and profitable, not only in the stock market but also in other investment vehicles. Tired of an industry saturated with fancy marketing and quick-fix gimmicks, Dale co-founded Wealth Within to provide genuine education as well as independent investment advice to traders and investors who have become disillusioned with the industry for one reason or another. Dale has over twenty-five years’ experience in various sectors of the investment industry, including banking, financial planning, stock market education and professional trading. For more than twenty years, Dale has achieved profitable returns in his private trading while sharing his knowledge and guidance with others to help them reach their goals when it comes to financial independence. An excellent and expert motivator, teacher and investment manager, Dale is in his element when helping others achieve their financial goals. 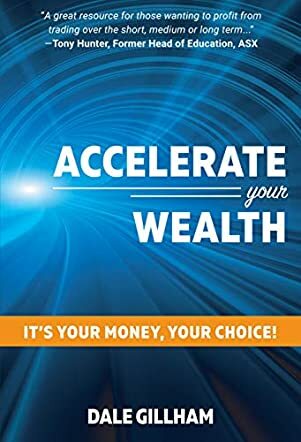 Accelerate Your Wealth is an appealing title for a book that genuinely delivers for those with a serious interest in learning how to invest responsibly in the stock market. Dale Gillham's approach isn't for the person who wants a magic bullet. It doesn't offer or deliver a get-rich-quick scheme. It doesn't pretend to offer easy solutions for people who seek a rapid road to riches or who want someone to fix problems caused by irresponsible spending. Dale is offering education for those who are willing to study, learn and diligently apply sensible strategies for steadily building a nest-egg. He explains, however, why methods adopted by many are less than successful, and why much of the ''conventional wisdom'' around stock market investing is actually not wise. Dale stresses that you have to be willing to save in order to ''Accelerate your Wealth''. You must invest wisely, but also ''leave it alone and let it grow''. There are no short cuts to riches. What I liked about Dale Gillham's approach is that he is honest about the requirement of discipline, and he is emphatic about the need for education and cautious practice. He stresses that you need a well-constructed plan and disciplined record-keeping methods. However, his plan doesn't require you to start with a large allocation of capital. Dale's method is equally applicable whether you have $100,000 to start with, or only $2,000. It just requires patient and diligent application of the rules. Accelerate Your Wealth isn't light reading. It takes a fair degree of concentration to absorb the knowledge Dale Gillham imparts, but he assumes no prior knowledge. Nor does his approach require significant expertise. He delivers information in plain English, with a minimum of technical jargon. He warns about the risks of emotional decision-making. He cautions about getting too greedy. He presents a method that is simple, low risk, and that it is thoroughly feasible to believe will generate consistent asset growth well above market averages, if applied in accordance with his recommendations. If you are serious about wanting to grow your wealth by investing in the stock market, Dale Gillham's Accelerate Your Wealth is a 'must-read'. Brilliant, couldn't put it down. It definitely is a must read for those who are serious about trading over the short, medium or long term. One of the best books I have ever read, thank you Dale Gillham!